Citizens attend a remote hearing on the state budget at Lakes Region Community College in Laconia on March 11. Becky Bryant of Lakes Region Community Services speaks on governor’s budget request to lawmakers. LACONIA – Becky Bryant says disabled people can’t wait in New Hampshire for services nor can their professional, longtime caregivers who have not received a wage increase at the cap levels in 13 years. She attended a remote legislative hearing on Senate Bill 2 – the biennial budget bill – at Lakes Region Community College on March 11. 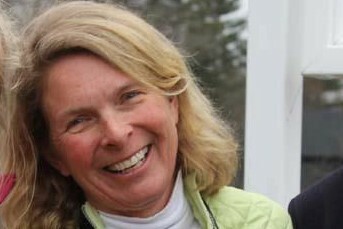 Bryant is the chief executive officer of Lakes Region Community Services. She was there to ask legislators to support the governor’s proposed 2.5 percent rate hike for developmental disability services and her repeated plea to lawmakers to deal with the waiting list for developmental services. LRCS, which has partnered with the state since 1975 to provide regional services, helps 1,200 residents primarily in Belknap County and employs 375 people. 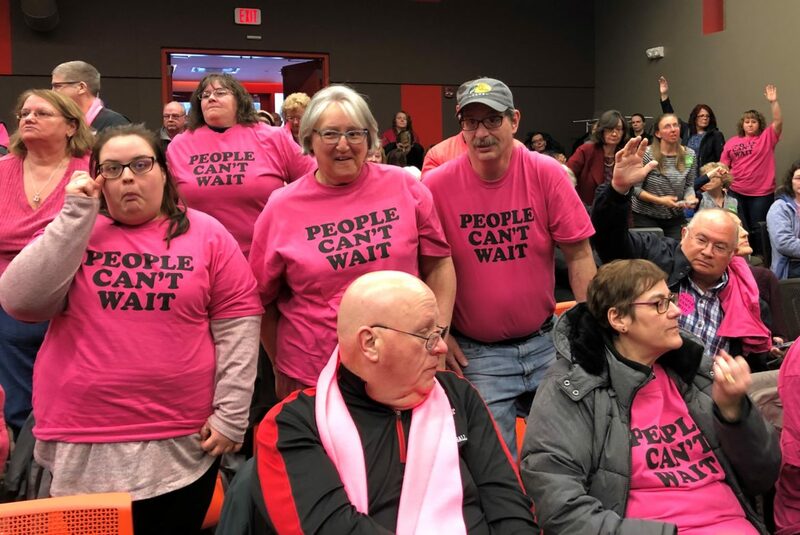 Of the 150 people packed into the hearing room, at least 65 were wearing pink scarves or pink t-shirts reading, “People Can’t Wait.” They were the clients, families, and caregivers. Many said it is hard to retain or fill staffing positions because the wages are so low. Bryant talked to InDepth.org before the hearing. She said many of the veteran employs have not seen a rise in the pay ceiling in 13 years.